It is a distinction to live to be 100 years old. Just ask Rose Shloss. 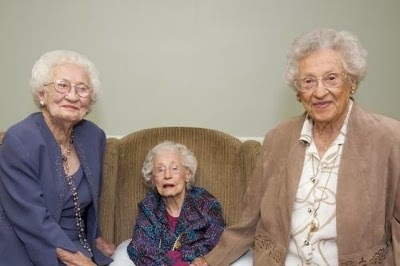 Not only is she 101, but her sisters are 104 and 110! Three sisters, all from one family, haven't been together in a decade. So Rose's Wish of a Lifetime™ came true when she traveled from her home at Villa of Waterside Retirement Estates, a Brookdale senior living community in Sarasota, Fla., to Bristol, R.I., to reunite with her sisters, Ruth Branum and Rubye Cox. Ruth, who is 104, made the trip from her home in Tulsa, Okla. to Rubye's community. "I could not have dreamed that I would be with both of my sisters," said Rose. "Given our ages and the fact that we live so far apart this is truly a Wish of a Lifetime™. I am excited beyond words to share this time with them." The last time the sisters saw one another was for Rubye's 100th birthday. Jeremy Bloom, the founder of Wish of a Lifetime™, the three sisters and their families celebrated the reunion Friday at Rubye's community in the seaside town of Bristol, R.I. Rose also got to see her first great grandchild 5-month-old Leela. Rose, her three sisters and three brothers grew up on a farm in rural Oklahoma with their parents. Life took the sisters to live in different places, but their families have always remained close even though travel and health issues have made it more difficult over the years. "The odds of reaching 110 are about one in 7 million," said Dr. Karl Pillemer, a Cornell University gerontologist. "If you add the fact that the three sisters are all currently more than 100 years old, the odds are so incredibly small that it would even be difficult to calculate them." "Family ties are so very important, especially when families are separated by great distance," said Janet Shloss, Rose's daughter. "Despite all of our technological means of communicating, nothing can replace the fundamental need to be hugged and held by a loved one. How truly remarkable that these three sisters were given the chance to one last time know the joy of being together." In 2010, Brookdale and Wish of a Lifetime™ formed a partnership to provide a helping hand in making some of the dreams of Brookdale's residents come true. This Wish was additionally supported by Anne Wojcicki, co-founder and CEO of 23andMe who donated Ruth's flight which required special accommodations and Silver Creek Manor in Bristol, R.I. the site of the reunion. To request a Wish, Brookdale residents fill out a Wish application explaining an experience they would like to have fulfilled and how that experience relates to one or more dimensions of Brookdale's Optimum Life® platform. Optimum Life cultivates whole-person wellness through fulfillment in the six key dimensions: purposeful, emotional, physical, social, spiritual and intellectual. Since the partnership's inception, more than 450 Brookdale seniors have had their Wish granted. For more information about Brookdale and Wish of a Lifetime™ visit www.brookdaleliving.com and www.seniorwish.org. Brookdale Senior Living Inc. is a leading owner and operator of senior living communities throughout the United States. The Company is committed to providing senior living solutions within properties that are designed, purpose-built and operated to provide the highest-quality service, care and living accommodations for residents. Currently Brookdale operates independent living, assisted living, and dementia-care communities and continuing care retirement centers, with nearly 650 communities in 36 states and the ability to serve approximately 67,000 residents. Through its ancillary services programs, the Company also offers a range of outpatient therapy, home health, personalized living and hospice services. Wish of a Lifetime™ fosters respect and appreciation for deserving seniors by fulfilling their life-enriching Wishes. Founded by two-time Olympic skier, World Cup gold medalist, entrepreneur, and former NFL football player Jeremy Bloom in 2008 in living honor of his grandmother, Wish of a Lifetime encourages the public to take an active role in granting Wishes through its Wish Connect program. Wish of a Lifetime has made 840 Wishes come true for seniors in all 50 states and the District of Columbia. 93 percent of Wish recipients stated they felt their quality of life improved after having their wish granted and 76 percent said they felt their overall health improved after experiencing a Wish. Learn more about #WishConnect, our volunteer program to help fulfill a senior's wish or visit www.seniorwish.org.